So, you’re taking an e-learning module on ethics for work and you get to the end of the course and… well, you just took the final quiz and it looks like you passed, and… you’re finished right?… but how do you know for sure? It’s kind of like that Eagles tune Hotel California. It may seem a bit too obvious for most e-learning designers, and maybe that’s why they forget it. But from the learner’s perspective, how do they know when they’ve finished the module? You’ve got to let them know! In this week’s e-learning challenge, David Anderson asked us to come up with a creative and interesting way to tell the learner they’ve completed the module. Here’s how I did mine. I decided it should say “Congratulations, you passed with flying colors” the assumption being they had to take a final quiz before exiting the course. That lead me to search out a free-to-use image of a bird in flight that I would animate. I used PowerPoint’s “remove background” tool to remove the bird from the scene it was flying over. Then I right clicked the image and saved it as a picture (PNG file). Then I duplicated the slide three times and used that same “remove background” tool to isolate the two wings and the body and saved them as images as well. I created a new PowerPoint file, found a suitable picture of a rainforest from overhead to put in the background of all the slides, then imported the PNG images of the two wings and body to put on top of it. Then I duplicated that slide and adjusted the wings slightly on each and saved all those slides as PNG images. Then I create a third PowerPoint file, imported the slide images I just created showing the wings in different positions, and set each picture to animate in “after previous” (instead of the default “on click”). Using the “save as” option, I selected the WMV file extension to save the PowerPoint as a video instead. I then created a Storyline file, and imported the WMV file. I set the video to start playing automatically. I also added a trigger telling Storyline to play the video again after it stops, so that the video would loop indefinitely. Lastly, I used the eyedropper tool to match the colors of the player and the text bubbles with the bird and the trees in the picture. Click here to see the finished product. And now, in case you’re wondering, you’re done reading this article. You can go home now. In my previous blog, I talked about how you can actually create videos in PowerPoint, save them as WMVs, and import them into other programs. I also had another idea I wanted to try out in PowerPoint for my band’s music video. 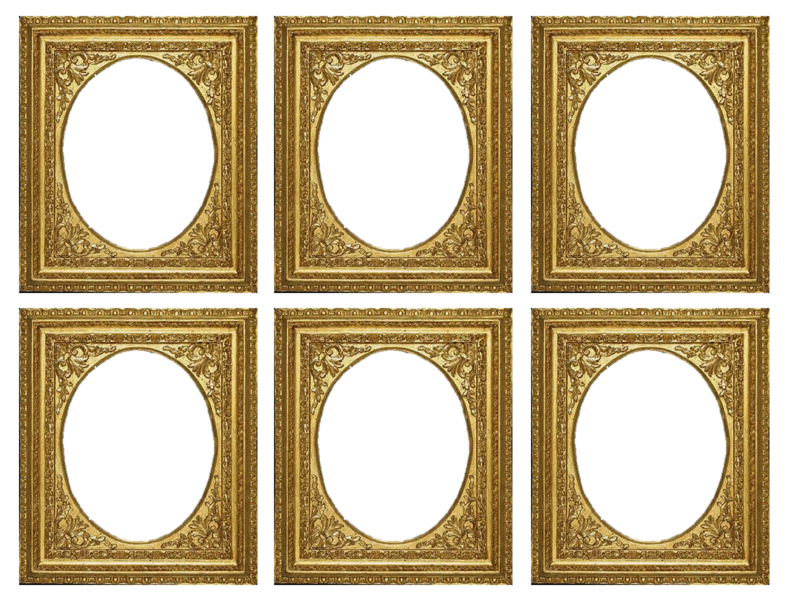 I had this image of six picture frames. I thought it would be cool if I could import six videos of us singing in the dark and put them into the picture frames to give it a spooky feel. Using PowerPoint’s Remove Background, I was able to remove the oval shaped part of the picture frame image so that when I put the videos behind the frame, you’d see them through the oval hole. Just click on the image and the Format tab appears, click the Format tab and you’ll see the Remove Background option on the far left, click it to start making your adjustments. Once I removed the oval center of the picture frames it was time to start putting in the videos. To import each video; I clicked the Insert tab, and clicked the Video dropdown. I selected Video From File and browsed out to the WMV file I wanted to import and clicked Insert. The video appeared. Just like with any image in PowerPoint, I was able to resize it and crop it into a variety of shapes. I did the same process for all six videos; importing, sizing, and cropping them to fit within the picture frames. I wanted all six videos to start playing immediately and in unison. So, with all six videos selected, I clicked the Playback tab, and selected Automatically from the Start dropdown menu. Then I clicked the Animations tab, and selected With Previous from its Start dropdown menu on the far right. This way, when I save this whole thing as a video file, all six videos will start playing right away. After adjusting the playback and animation settings, I right-clicked on the image of the six picture frames and clicked Bring to Front from the pop-up menu. I did this part last because it was easier to work with my videos while they were still in the front. And just like in the previous lesson, I clicked File/Save As to save it as a WMV (Windows Media Video) file. Because of the six videos on this slide the saving process took a good amount longer, but as you can see, it worked out great! As always, let me know in the comments if you have any questions about this whole process. I hope this inspires you to create some incredible videos using PowerPoint.